An evening of poetry, readings, and art by Drew Cameron, Susan Griffin, Amber Hoy, Aaron Hughes, Martin Lesinski, Aimee Phan, Ted Sexauer, Ehren Tool, Julie Thi Underhill. The vivid writing of the WWI poets reverberates through the work of contemporary poets and writers who will read work that reflects experiences of war from Vietnam to Desert Storm to Afghanistan and Iraq, and the search for peace. Their writings explore the many ways war touches our lives—from soldiers in war, returning veterans, protesters, family members waiting for loved ones to return, to refugees fleeing war and arriving in an unfamiliar country. Drew Cameron, Iraq war veteran and artist is a founding member of Combat Paper which transforms military uniforms into handmade paper. Drew Cameron is a hand papermaker, printer and book artist. He has his degree in Forestry from the University of Vermont and served in the US Army from 2000-06. His current and ongoing work with Combat Paper and as a partner in the Shotwell Paper Mill in San Francisco is practicing and teaching the art and craft of hand papermaking and encouraging others to do the same. Susan Griffin has written over twenty books, including non-fiction, poetry and plays. Among them, A Chorus of Stones, the Private Life of War, was a finalist for the Pulitzer Prize and a NY Times Notable book in the year it was published. Woman and Nature, considered a classic of environmental writing, is credited for inspiring the eco-feminist movement. The Book of the Courtesans introduced a hidden chapter in women’s history. Along with her co-editor, Karin Carrington, she edited an anthology called Transforming Terror, Remembering the Soul of the World, with a preface by Archbishop Desmond Tutu, and contributions from thinkers, psychologists, spiritual and political leaders and poets from diverse cultures and religions. Among her awards are a Guggenheim Foundation Award and an Emmy. Amber Hoy grew up in Yankton, South Dakota. She enlisted in the US Army and deployed to Qayyarah West, Iraq as an ammunition specialist from 2006-2007 with the 592nd Ordnance Company. She later received her Bachelor of Arts degree with an emphasis in photography from University of Alabama at Birmingham and a Master of Fine Arts degree in Photography + Integrated Media from Ohio University. Her work explores questions of military service through the use of photographs, stories and abstractions: images and words pointing to each other, providing and withholding clues. In this work she speaks to incidences of trauma, sexism and class dynamics, combining images of past and present showing the slippage between military and civilian life. Aaron Hughes is an artist, activist/organizer, teacher, and Iraq War veteran, whose work seeks out poetics, connections, and moments of beauty, in order to construct new languages and meanings out of personal and collective traumas in order to create projects that deconstruct systems of dehumanization and oppression. He works with a variety of art, veteran, and activist organizations and projects including: Warrior Writers, Dirty Canteen, National Veterans Art Museum, and Iraq Veterans Against the War. Hughes has shown his work in museums and galleries throughout the United States and internationally. He is currently a recipient of The Claire Rosen and Samuel Edes Foundation Prize for Emerging Artists, which is supporting his work on the Tea Project. Martin Lesinski is a photographer, writer and combat disabled Vietnam veteran. In the 70s, he began using writing in combination with self-portraits and government documents to explore his identity as a disabled veteran. His work has been shown in galleries, published in Dumb Ox, an art journal, and as part of a nationally touring show, Disability and the Arts. He is a member of the Veterans of War, Veterans of Peace. His writings are first-hand reports of shaping a life of healing. They articulate the experiences of veterans and offer families and non-veterans insights into not the blood and guts of war, but the difficulties veterans encounter navigating a world shaped by PTSD. Aimee Phan grew up in Orange County, California, and now teaches in the MFA Writing Program and Writing and Literature Program at California College of the Arts. A 2010 National Endowment of the Arts Creative Writing Fellow, Aimee received her MFA from the University of Iowa, where she won a Maytag Fellowship. Her first book, We Should Never Meet, was named a Notable Book by the Kiryama Prize in fiction and a finalist for the 2005 Asian American Literary Awards. She has received fellowships from the MacDowell Arts Colony and Hedgebrook. Her writing has appeared in The New York Times, USA Today, Guernica, The Rumpus, and The Oregonian. Ted Sexauer was an Army Special Forces medic who served two tours in Vietnam, first with 571st Dust-Off (Helicopter Ambulance) and then as a senior medic with the 173rd Airborne Brigade in northern Binh Dinh province. He is a poet, a member of Veterans for Peace, and dedicated peace activist. Julie Thi Underhill is an interdisciplinary writer, artist, teacher, and scholar whose inheritances from war have deeply shaped her life. Born in Missouri in 1976 to a Cham-French refugee mother from Viet Nam and an American father who served in Viet Nam, Underhill has published in Veterans of War, Veterans of Peace, Troubling Borders, Embodying Asian/American Sexualities, Takin’ It to the Streets: A Sixties Reader, ColorLines, Hayden’s Ferry Review, and TrenchArt Monographs. Underhill currently teaches literature and composition at California College of the Arts while completing her doctorate in Ethnic Studies at UC Berkeley. Nancy Sue Brink, a member of the Berkeley Community Chorus & Orchestra, will host the event. She is a poet, writer and media-maker. Her writing has appeared in Veterans of War, Veterans of Peace, the Pacific Raptor Report, and in Calyx Journal. Her film work touches on issues in science, art, the environment, and social justice. She has created media for museum exhibits and nonprofits and is currently working on a mixed-media piece that explores the history of military dog tags. The Legacy of Wilfred Owen is co-sponsored by our community partners, Veterans of War, Veterans of Peace and Warrior Writers. 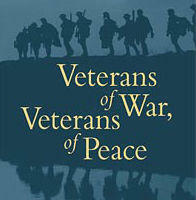 Veterans of War, Veterans of Peace is entering its 25th year of bringing people together to write about the trauma of war; their book by the same name, edited by Maxine Hong Kingston, won the 2007 Northern California Book Reviewers Special Award in Publishing and the 2008 Medal for Distinguished Contribution to American Letters. Warrior Writers‘ mission is to create a culture in which veterans and service members speak openly and honestly about their military experiences. In the form of veteran-focused writing and art-making workshops, they provide a creative community for self-expression and reflection, while also fostering mutual understanding and peer-to-peer support. Participants are encouraged to share their art in the form of books, performances, and exhibitions, thus empowering veterans to tell their stories and voice their opinions in front of a wider audience. This process also provides opportunities for the public to gain a deeper sense of the lives of veterans and service members—something sorely needed in a society where so few serve in the military. In June 2016, the Berkeley Community Chorus & Orchestra will perform Benjamin Britten’s War Requiem. Written for the reconsecration of Coventry Cathedral in England in 1962, which was destroyed in WWII, it is a statement of Britten’s anti-war convictions. This masterwork of twentieth century music intersperses the poetry of WWI soldier Wilfred Owen, killed a week before the armistice, with the traditional Latin Mass for the Dead. The War Requiem is an audacious undertaking for a community chorus, requiring a large chorus, a children’s chorus, two orchestras, and three soloists. But who better to sing this massive anti-war piece than a community chorus in Berkeley? BCCO will perform the War Requiem on June 3, 4, and 5 at Hertz Hall on the Cal campus. But in the months leading up to the concerts, BCCO is sponsoring a number of free readings, lectures and workshops for the community that explore the history, music, poetry and themes presented by this powerful work. This series of talks at the library will present three experts on WWI, Britten’s life and music, and Owen’s poetry; the fourth session will introduce you to local poets writing about war and the search for peace.